Note: Excludes the 11.2 million households without a vehicle. The housing stock in the United States could support significant numbers of plug-in electric vehicles. Of households that own at least one car, an estimated 49% (49.6 million housing units) park within 20 feet of an electrical outlet, based on recently released responses to a new question from the 2009 Residential Energy Consumption Survey (RECS). Certain housing characteristics limit potential for electric (either plug-in hybrid or all-electric) vehicles, especially the type of housing. Excluding households without cars and those where the respondent did not know whether an electrical outlet was accessible, 60% of respondents in single-family detached houses park within 20 feet of an outlet, as opposed to only 14% of respondents in apartments. Most electric vehicles can be charged using the same outlet as a home appliance. However, some electric vehicle manufacturers recommend installing a separate charger that can charge the vehicle faster. Housing stock in some regions is better suited to support electric vehicles. 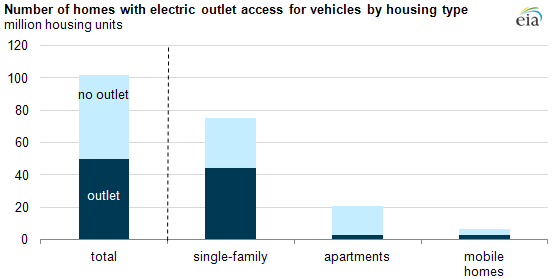 In the Northeast Census region, less than 40% of all respondents in single-family houses park their car within 20 feet of an electrical outlet. In contrast, for single-family houses in the Midwest region, more than 60% of respondents park their car within 20 feet of an electrical outlet. Newer houses tend to provide better access to electrical outlets. Differences based on the age of the housing unit exist, but the major increase in outlet access did not occur until the 1990s. Income and location in an urban area also influence accessibility of outlets for charging vehicles. About 65% of respondents from single-family detached housing units with incomes greater than $80,000 per year park with access to an electrical outlet (see chart below). Only 47% of respondents from urban areas have access compared to 55% from rural areas, reflecting the prevalence of apartments in the urban housing stock.